I am writing this on February 10, three days after the first launch of Falcon Heavy. I’m impressed by the achievement, and amused by a mannequin in a Tesla floating through space. You would never have seen that during the days of Apollo. For all the shift from government to private space flight, some things remain the same. All rockets have always been made by private companies, and the primary customer has always been the government. The degree of participation by private industry on the consumption side has changed considerably. Still, if it were not for the government contract to supply the International Space Station, it is unlikely that the original Falcon would have lived long enough to beget Falcon Heavy. Falcon Heavy is a big deal, but not a total revolution. That doesn’t keep me from doing handsprings at its launch. 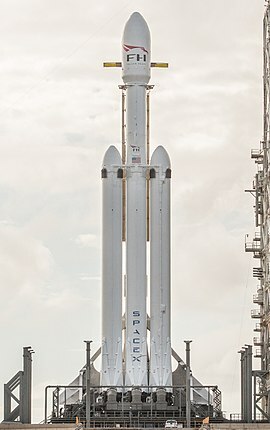 I know that teachers all over America are going to be using Falcon Heavy as motivation for their students to work hard and get ready to join the movement into space. Students who are in middle school today will be walking on Mars in thirty years. Any kid who isn’t fired up about that, doesn’t deserve to go. Exciting tomorrow’s astronauts is the job of science fiction writers and science teachers, as well as those who are doing the actual work of exploration. I’ve been involved in two and a half of those enterprises. For me it started with science fiction, first Tom Swift, Jr. and Rick Brant, then all the glorious writers of the thirties through the fifties when I finally got access to a real library. By the time I reached my teens about 1960, I was hooked. That was about the time real astronauts first appeared. (And the time the words astronaut and cosmonaut appeared, so that we had to give up that wonderful word spaceman.) I also became aware of the X-planes, which had been making aerospace history since my birth year. It was an exciting time, culminating in a series of moon landings. High school kids like me didn’t get to work at NASA, but I did research at the level available to me. Since my two science loves were space and ecology (starting before ecology became part of the public consciousness), I developed an “Ecosystem Operable in Weightlessness” as a junior and continued as a senior with “A Study of the Nutrient Uptake of Chlorella Algae”, both as science fair projects. That is the “and a half” from three paragraphs back. Those got me a summer job as a science intern and got me into college with a scholarship. I started in biology, switched to anthropology, got drafted, survived, went back to grad school then ended up being seduced by writing. I wrote science fiction. I still do, but for twenty-seven years, a $ad lack of fund$ caused me to also teach middle school science. Teaching math is teaching math, and teaching history is teaching history. Teaching science, however, is more than passing on skills and information; it is also firing up your students to become future scientists, or at least future citizens who understand and appreciate the role of science in our world. You really need to love your subject to do that, and I did. It is also an easy subject to generate enthusiasm about. While others are teaching adverbs, food groups, the three branches of government, and quadratic equations, science teachers get to teach about explosions, dead animals rotting at the side of the road, poop, and the exploration of space. I pity my colleagues on a warm day in spring when every eye is out the window. I got to take my students out to throw baseballs into the air and analyze how the baseballs’ trajectories were the same ballistic path as a Redstone rocket with Alan Shepard aboard. Middle school students are just the right age for this, and I loved teaching them. That probably tells you more about how my mind works that I should admit to. The exploration of space, if you start about the time of Goddard and carry through Von Braun and his V-2s all the way to the moon, is the story of mankind in the twentieth century. You can’t teach it properly without including World War I and the rise of aircraft, the rise of the Soviet Union, World War II, the Cold War, the promise and danger of nuclear power, and the ugly political motivations behind the glorious achievements of Apollo. History is a good starting point for firing up young scientists, but it has to be followed by a proper answer to the question, “All right, fine, but what will I get to do.” That part was tough. From the mid-eighties to the turn of the millennium was an era in which manned space exploration was undergoing a drought of imagination, will and accomplishment. Project after project failed to deliver, but those failures were not evident at the outset. Year after year I told my students, “This is your future.” And year after year, those futures faltered and died. Maybe these non-starters don’t deserve to be remembered, but if you don’t know about the drought, you can’t appreciate the rain that follows. On March 26 and April 5 I’ll explore those projects which began with a flurry of excitement, then died quickly and quietly. This entry was posted in A Writing Life and tagged history, science, science fiction, spaceflight, teaching, writing on March 19, 2018 by sydlogsdon.